From spending too much money on laundry detergents and softening agents to constantly battling dry skin and dull, lifeless hair, you need the ultimate solution to your hard water problems: The Culligan Water Softener. Our Culligan water softeners reduce scale build-up. Most importantly, a Culligan water softener means better water throughout your entire house. Culligan Water Softeners are good for your entire house and all of your water. No more clogged pipes and hot water heaters. Hard water creates a buildup of scale in your plumbing. When pipes get clogged, water is delivered slower throughout your home. Some of your appliances, such as hot water heaters, will last longer and need fewer repairs with softened water. Our softeners remove the materials that make your water hard and causes scaly buildup on utensils, porcelain and even your skin! Advanced features help you save money by using less salt, water, and electricity. A Culligan Water Softener practically pays for itself. The average family saves $71.00 per month because they use less soap, detergent, electricity, and gas for the water heater. 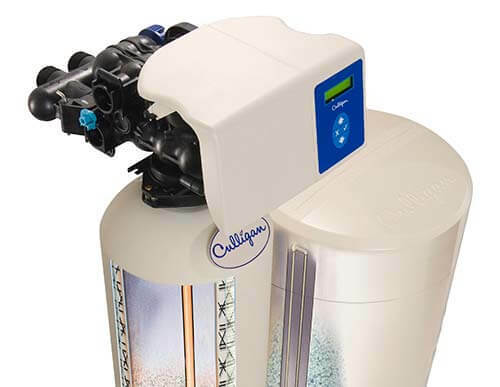 A Culligan water softener delivers soft, conditioned water which doesn’t promote scale buildup in pipes, offering you better water flow and saving you money on costly plumbing repairs.